An incredibly exciting truck game! To rule the road, you will have to be the best ! 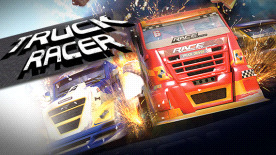 Truck Racer gives you the opportunity to drive and customize plenty of trucks in order to take part of crazy races through four solo modes(championship, time attack, elimination, quick race). You can also play with friends (2 players offline and 4 players online). Ride through smoke and danger to become the new king of the road !